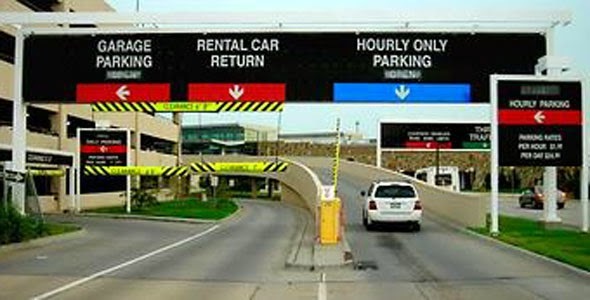 Yesterday I was asked to pick up Mr. Fisher from the Enterprise Car Rental post at Will Rogers World Airport. Yes, both of OKC’s airports are named for two guys that died in the same 1935 plane crash. So as you know I have a roof rack and the added height was my first concern considering all the close parking is in the garages at the airport. My colleague here at work is 6’2″ and as we were leaving work yesterday I had him stand next to the Range Rover so I could get an estimate of how tall the Rangie stood today. We guessed 6’6″. As I pull up to the parking garage which inside resides the Enterprise Rental office they had a bar hanging to prevent these very problems. Both lanes had a bar that said 6’8″. The bar on the left lane hung at least 2 inches below the one on the right and was off kilter a bit. I assumed someone had rammed it. I chose the right lane. I slowed way down opened the sunshade on the sunroof and proceeded with caution. You can see the different heights on the bars. The good news, I was well clear of it AND when I got to the actual garage I cleared that too. The bad news, I don’t think I can park in the park garage at McBride Clinic any longer. That garage has a very low clearance. I was thinking of doing an experiment and taking the rack off for a couple of tanks of gas to get the actual mileage it cost me. I’m guessing 1.5 miles per gallon. I normally drive like an idiot and go as fast as the traffic will allow. I also plan to limit myself to 65 mph and see how that affects the gas mileage on my daily commute. I’ll report the numbers as they come up. I need to replace my oxygen sensors and may do that first depending on cash flow in January. I saw a couple of Classics this week. ON my morning commute I saw a black Classic with a “Keep Calm and Chive On” sticker on the rear glass. He gave me an enthusiastic wave. The other was a white one parked on the street in OKC. I’ve also had several emails of late referencing the difficulty of finding the resistor pack for the blower motor. Apparently they are not in stock any where. This entry was posted in Range Rover Classic, roof rack. Bookmark the permalink. ← FINALLY!! Some Common Sense from Washington, D.C.